Happy spring! Time to roll up those sleeves, break out the elbow grease, and do a little spring cleaning. This year, think beyond sparkling floors and dust-free cupboards. What about those old favorites that have seen better days, like trusty copper pots or well-used china? Household items like these that seem too worn or stained to be cleaned can still be brought back to life—with a little know-how and some common products you may already have in your home. As many good cooks know, copper makes an excellent material for frying, sautéing, and simmering. But when your pots begin to look dingy, sprinkle the copper surface with salt, then pour a little vinegar over it and scrub with a hard sponge. If your porcelain dishes are showing the signs of many years of home-cooked dinners, you can give them new life and lessen the appearance of scratches with a gentle polish or cleaner made especially for porcelain (check your hardware store for this one). Think that old stain will never come out? Try mixing one part vinegar with two parts water. Using a spray bottle, soak the carpet stain and cover with a damp white cloth. Set an iron to steam mode and place it over the cloth for about 30 seconds. Repeat this step as many times as needed, until the stain has been transferred to the cloth. Finally, blot up the excess moisture with a paper towel or use a blow dryer to finish the job. Leftover beer can be used in a number of surprising ways. To give your wood furniture a new luster, pour some flat beer onto a clean cloth and rub the entire wood surface. Then use a dry cloth to wipe the surface once more. Cleaning hardened black char off of baking trays and pans can seem like a losing battle. 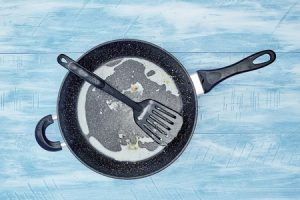 But if you combine baking soda with hydrogen peroxide to make a paste, then spread it on the baking pan and leave it for 30 minutes, you can simply rinse the residue away. Sometimes tidying up for Spring requires just a bit of creativity. With quick and simple tricks like these, your home will be spick and span by the time April showers and May flowers come along!